Did You Know That Baking Soda is Safe to Use on Pets? Baking soda is a natural cleaner and deodorizer that every pet owner likely has on hand. It’s a good option if you wish to avoid cleaning products that contain potentially toxic chemicals or perfumes. Baking soda contains no harmful chemicals and poses no danger to children or pets unless it is ingested in large amounts. Always consult your veterinarian before using baking soda on your pet and spot test before using baking soda to clean carpets and furniture. Pet urine is usually acidic, which plays a role in its ability to produce a foul-smelling odor. Baking soda is a base and pet urine is acidic. When you put them together, baking soda chemically has the ability to neutralize acidic substances and make them more alkaline, eliminating the odors. sprinkle baking soda on carpets and furniture to get rid of pet odors in the home. Leave it on for about 20 minutes then vacuum it up. Always test a spot first to make sure the baking soda doesn’t discolor your carpet or upholstery. Baking soda will also eliminate doggy odors in your car. Sprinkle it on the seats and floor mats. The longer the powder sits, the more odor it will absorb. Vacuum all surfaces and throw out the disposable vacuum bag immediately, just in case it contains any fleas, ticks or mites. Another trick to keep your vehicle smelling fresh is put a tablespoon of baking soda in the ashtrays. Put pet bedding in your washing machine. Use a mild (no dyes or fragrance) laundry detergent and 1 cup of baking soda. Place the bed in the dryer for 15 minutes with a pet-safe dryer sheet, and if it’s still wet, let it air dry to avoid shrinking. The dryer sheet is important to use when drying because it will help to remove excess hair from the bedding. If your pet spends time rolling around in your bed, when you wash your sheets, add 1/2 cup baking soda into the washing machine to neutralize the odors. 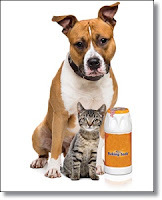 Baking soda can help you clean up your dog or cat’s “accidents”. Mix equal amounts of white vinegar and baking soda to create a runny paste. Apply the paste to the soiled carpet or furniture, let it sit for a few minutes, then sponge it up. When it’s dried, vacuum the area. Before using the paste or applying baking powder on its own, blot up as much of the liquid as possible. It helps to place a book on the cloth and stand on it to ensure you get it all out. Many brands of kitty litter contain baking soda for its ability to neutralize odors. If your current kitty litter doesn’t contain baking soda, you can sprinkle a thin layer of baking soda on the bottom of the box before adding the litter. Baking soda also works as an odor eliminator for pets between baths. In between wet shampoos, baking soda may be used for dry shampooing dogs and cats. Start by brushing your pet to remove any dirt or loose hair. You may want to do the next step outside. Rub baking soda into your pet’s fur and massage it into their skin, making sure not to set it into their eyes. Let the baking soda sit on your animal’s fur for five minutes and then brush out the fur. To remove any remaining baking soda, rub your pet down with a dry towel, otherwise your dog or cat might lick its fur and ingest the baking soda. While baking soda is harmless for your pet to ingest in small quantities, it’s best to remove as much as possible. Consult with your vet before using baking soda as a dry shampoo to make sure your pet is not allergic to it. Unless your dog has rolled around in dirt or sand, you only need to use a wet shampoo every two or three months. Many pet shampoos contain baking soda which helps eliminate odors. However, you can make your own shampoo by mixing three tablespoons baking soda with one quart warm water. Wash your dog with the solution and massage it into his coat. Give the baking soda a few minutes to neutralize odors. Next, apply your regular, vet-approved dog shampoo and massage it into your dog’s skin. Rinse your dog in clear water and make sure you do not leave any shampoo residue, which can make your pet itch. If you trim your pet’s nails too close, you may accidentally draw blood. To stop bleeding, dip the nail in baking soda and applying pressure. If your pet is sprayed by a skunk, baking soda alone will not remove the foul odor. A mixture of ¼ cup baking soda, 1 teaspoon of liquid soap and 1 quart of 3-percent hydrogen peroxide is a recommended solution. It’s best to use this mixture outdoors or in a basement sink to avoid bringing the odor into your home. Do not get the solution in your pet’s eyes and do not leave the mixture on too long or the peroxide will bleach your pet’s fur. Rinse your pet well, then follow with a vet-approved pet shampoo and rinse again. Towel dry your pet before bringing him into the house.